CERT volunteers had a scavenger hunt of sorts last Saturday as they searched for signs placed around town representing downed wires, fallen trees and resident complaints. The goal was to simulate the kinds of problems that have arisen in Ridgefield during past storms as they tried a new program called Crises Track, a program that will help prioritize and assess information in real time. 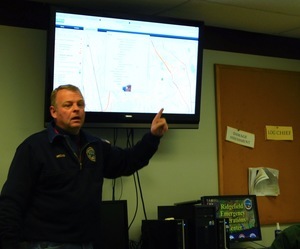 Responders will send information back via the program which is monitored at the town’s Office of Emergency Operations, where it shows up on a map with photos and details of the damage.